The humble cuckoo clock is a reminder of simpler times, when we could be delighted by a bird popping out of a box on the hour. The Charming Bird watch from master Swiss watchmakers Jaquet Droz is a unique take on the cuckoo clock aesthetic, using 18th century automaton to make a truly breathtaking watch. The transparent watch face lets you see all of the watch’s inner workings – cogs, pistons, gears, and all of the other bits and bobs that keep wristwatches running. 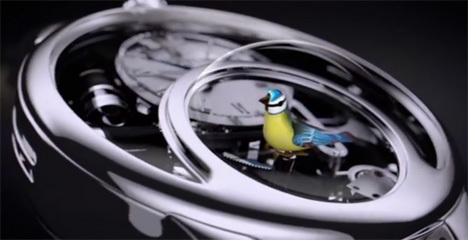 That alone is lovely, but the addition of the singing bird is what makes this watch charming. 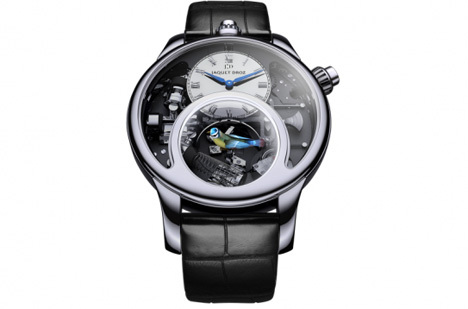 The songbird sits in a transparent bubble near the bottom of the watch face. It is seemingly impossibly intricate, staying true to even the tiniest details on the bird’s feathers and eyes. See more in Clocks & Watches or under Gadgets. August, 2013.